Are you trying to decide whether or not it’s worth using CPAP for your sleep apnea? This page is the most comprehensive guide to CPAP pros and cons for obstructive sleep apnea. 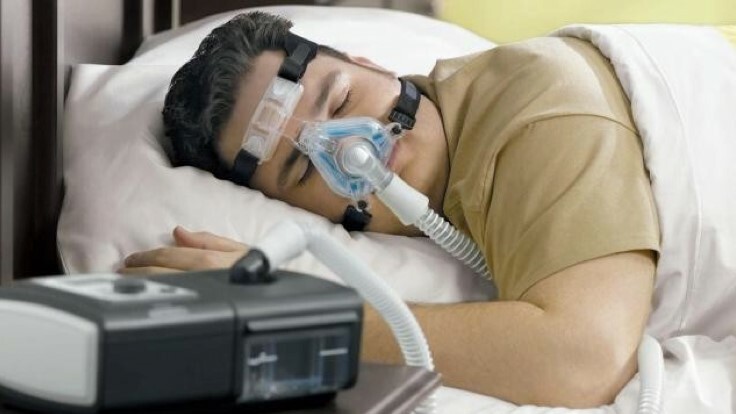 ○ Why Do People Hate CPAP? Nearly 18 million people suffer from obstructive sleep apnea (OSA). And CPAP continues to be the most frequently prescribed therapy for people suffering with OSA, with the National Institutes of Health stating that CPAP is the preferred treatment for OSA. But if using a CPAP is so beneficial, why do so many patients hate their machines and stop using them? A report from the US National Library of Medicine states that only 30-60% of CPAP users use their CPAP machine nightly. The rest of CPAP patients use their machines sporadically or not at all. What causes this high rejection rate? Dr. Ira Shapira, former assistant professor at Rush Medical School-Sleep Disorder Service, cites one main reason that patients hate using a CPAP: the mask must be worn all night, every night. 8. The need to take the CPAP along when traveling away from home. While some of these reasons may sound trivial, they are very real to CPAP users and serious obstacles that keep people from using their machines. Most of the complaints with CPAP equipment focuses on the difficulty and frustration of using the mask, the main element in CPAP treatment. The best CPAP mask for sleep apnea has a snug fit over your nose and mouth to deliver pre-measured, CPAP-pressurized air down your airway. This is how the system keeps your upper airway from collapsing while you sleep. The Department of Otolaryngology, Head and Neck Surgery at Columbia University reports that regardless of which type of sleep apnea you have, when you follow your doctor’s prescribed CPAP usage schedule, you’ll have fewer sleep apnea episodes. One big benefit you’ll enjoy if you’re able to wear your CPAP equipment for a whole night is the ability to experience a full night of quality sleep, free of apnea episodes. So again, if using CPAP eliminates sleep apnea, which results in so many positive benefits, why do so many people choose not to use their machines? Keep in mind that there is no one-size-fits-all treatment for many health conditions. Because we are all individuals, our bodies react differently to medical treatments. And that’s especially the case with sleep apnea. When trying to determine CPAP machine options, you’ll probably start with the price of the machine. CPAP machines run from $400 to $2,500, depending on the features included with them. You’ll also need to calculate the costs of keeping the machines and parts clean, as well as regular costs for supplies, but those costs are minimal compared to the cost of the actual machine. If you’re looking for cheap CPAP mach﻿﻿ines﻿﻿, make sure you look into having your health insurance plan help you pay for the unit. You may find that your insurance company will pay for any machine your doctor recommends. Or the insurance may only help you pay for the machine if you pick a certain brand and model that the insurance company recommends. If you want a particular unit that your insurance won’t cover﻿﻿﻿, you may have to pay for it out of pocket. Depending on your deductible, you may want to consider paying out of pocket to obtain a cheaper CPAP machine. Online shopping for these machines is an option for a cheap CPAP machine. And don’t forget to look at ﻿﻿﻿used CPAP machines﻿﻿﻿. One form of used CPAP machine that some insurance companies prefer is renting the machine. One reason insurance companies prefer rentals is to ensure the machine works for you. Rather than going through the expense of purchasing a new machine, you’ll test it first to see if it is compatible with your apnea symptoms. Over the past two decades, federal health organizations, medical clinics, and medical centers at prominent universities have examined and tested CPAP use by sleep apnea patients. These organizations agree that CPAP is supposed to be a painless treatment, but they also agree that CPAP is not flawless and has many “compliance” problems. ■ Trouble getting used to the CPAP mask. One of the most common problems suffered by CPAP users is the discomfort and claustrophobia that comes with sleeping with a CPAP mask. In fact, in one Mayo Clinic article, it’s reported that most new CPAP users have trouble getting used to wearing a mask while sleeping. For some people, it takes weeks or months to get used to the mask. Other can’t get used to it at all and give up on CPAP treatment. ■ Leaky mask. As mentioned in a report from the National Heart, Lung, and Blood Institute, one frequently stated problem with a CPAP is a leaky mask. If your mask leaks, the amount of air pressure you receive may not be adequate. ■ Bad mask fit. Finding a CPAP mask style that correctly fits snugly on your face can be difficult, whether you use a mask for just your nose or mouth, or have a nose and mouth combination mask. ■ Dry or stuffy nose after wearing a mask. Some machines have heated humidifiers to prevent this problem. You can also use a nasal spray before putting the mask on. ■ Very dry mouth. If you sleep with your mouth open, the forced air pressure does add to a dry mouth situation. Using a chin strap to keep your mouth closed while sleeping can help. (If you're interested in straps, make sure to check out the research we've done to find the best CPAP chin strap). ■ Annoying noise made by the machine. ■ Having to manually clean your CPAP equipment on a regular basis. If you don't clean the CPAP machine and related equipment daily, dangerous bacteria can build up inside the mask and hose. 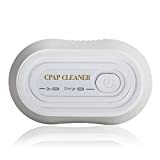 The best solution to the slog of manually cleaning your CPAP equipment is an automatic CPAP cleaner, such as the SoClean CPAP Cleaner and Sanitizer. 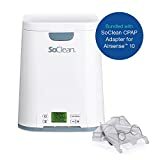 Make sure to check out SoClean CPAP reviews before investing in this kind of machine. ■ CPAP hose restricts your movement in bed. This is a side effect that most people aren't aware of before they use a CPAP - some people find the hose very restrictive. A simply solution is to purchase an inexpensive device ﻿﻿﻿﻿hold your CPAP hose. ■ Difficulty in traveling (because you can't easily transport your CPAP). Fortunately, recent advances have made CPAP machines much smaller and lighter. As well, portable backups for CPAP batteries allow sleep apnea sufferers to travel freely - whether it's on business trips, camping, or other travel. Of course, you may only experience one, two, or none of these problems, or you may experience a different problem. Most of these issues occur while you’re getting used to your CPAP – but some people never get used to these problems. Now that you know about the pros and cons of using a CPAP, there’s another point of interest that you need to consider, and that is the risk of potential side effects. Side effects are possible dangers that can occur with almost any type of equipment or medication. This is also true with CPAP machines. Some people adapt to CPAP without any problems while others may develop negative side effects from either the intake of forced air or from materials inside the CPAP. ♦ Congestion, sneezing, nosebleeds, sinusitis, and a runny nose. 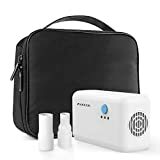 These effects can sometimes be alleviated if your CPAP has a heated humidifier. ♦ Stomach discomfort and bloating can result from an incorrect air pressure setting. Your CPAP specialist can re-adjust the pressure setting to eliminate these side effects. ♦ The feeling of suffocation or claustrophobia. This is a difficult side effect to overcome with CPAP use, but can be treated with cpap alternatives. ♦ Sore chest muscles. This is a common result of having a more open lung capacity after years of decreased breathing ability. The soreness may subside as your body adapts to its new ability to handle more healthy levels of air intake. ♦ Facial skin rashes, abrasions, sores, acne-ulcers, and pinkeye. These are the usual side effects resulting from air leakage. Changing to a newer, cloth mask can help you get relief from some of these issues. ♦ Development of tinnitus from the noise made by the CPAP machine. If you experience this side effect, talk with your doctor about changing the style of your CPAP to a more modern system that may not require the use of a mask (see the CPAP ALTERNATIVE section that follows). ♦ Development of bronchitis and respiratory infections. These side effects can be due to incorrect or infrequent cleaning of your CPAP equipment. Following the manual’s maintenance guide can help to prevent these conditions. You’ll be happy to know that there are many natural remedies for sleep apnea, sleep apnea devices, and (a last resort) surgeries that you can turn to if CPAP is not for you. It’s a great question. 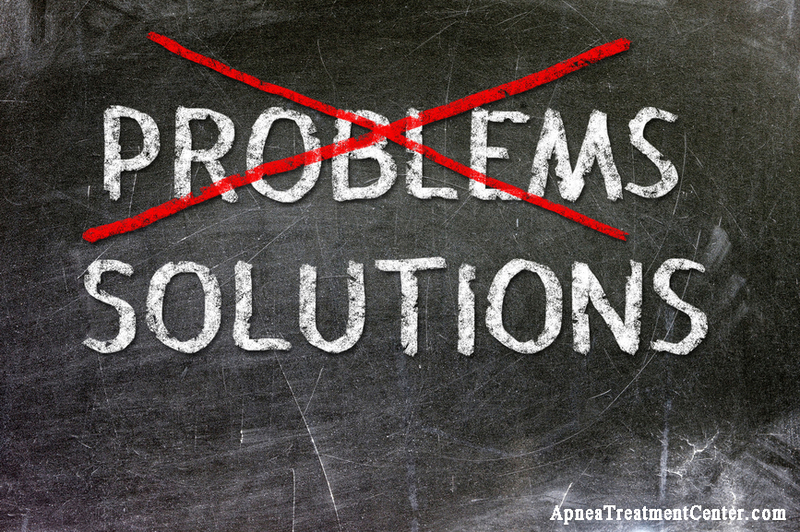 And the answer, in our experience here at Apnea Treatment Center, is that many doctors simply don’t know about alternatives to CPAP. And even if they did know about new treatments, what incentive would they have to prescribe them – when CPAP manufacturers make billions of dollars a year (and their profits are growing)? 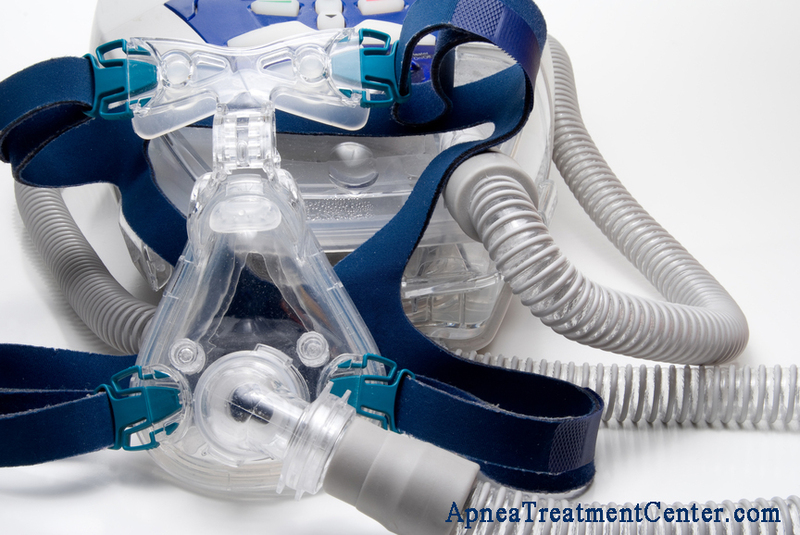 The fact is, there are many choices available for sleep apnea treatment without CPAP. In the section below we touch on a handful of those alternatives, including home remedies for sleep apnea, sleep apnea devices, and several types of surgery. Over the past decade there has been a lot of research into alternative therapies for sleep apnea that can be done at home. Many of these treatments are easy, safe, inexpensive, and effective (and they’ve been proven in clinical trials to eliminate or reduce sleep apnea). The most exciting type of at-home sleep apnea treatment is sleep apnea exercises. What Are Sleep Apnea Exercises? These aren’t calisthenics! Sleep apnea exercises involve exercising the muscles around your upper airway or your diaphragm. And one particular type of exercise focuses on fixing the way you breathe. The key difference between the different sleep apnea exercises is the type of exercises used to strengthen your breathing-related muscles. When you fall asleep, your throat muscles aren’t strong enough to keep your upper airway open – which is why your throat closes and you stop breathing so many times during the night! Sleep apnea exercises cure this – by strengthening the muscles of your upper airway. 1. Mouth and throat exercises for sleep apnea are hands-down the best new sleep apnea treatment we’ve seen here at Apnea Treatment Center. b. Strengthen your tongue muscles to prevent your tongue from sliding backward into your throat during sleep. 2. Singing exercises for sleep apnea are similar to mouth and throat exercises, but involve (you guessed it!) singing specific songs. The songs are meant to work your vocal chords and tone the muscles around your upper airway. 3. ﻿Didgeridoo therapy for sle﻿ep apnea involves playing an ancient Australian wind instrument called a didgeridoo. By blowing into the “didge” (as it’s called for short), you’re also strengthening your airway muscles. 4. Yoga exercises for sleep apnea strengthen your diaphragm, which can increase your breathing function and reduce sleep apnea symptoms. As a bonus, yoga has also been proven to reduce stress, and can even help you to lose weight! 5. The Buteyko breathing technique for sleep apnea is a different twist on sleep apnea exercises. 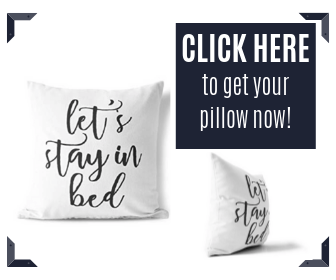 Sleep apnea pillows can be purchased over-the-counter and are specifically designed to keep you from sleeping on your back (because that position increases pressure on your airway). Sleeping on your back also encourages your tongue and uvula (that tiny bell shaped piece of tissue at the back of your soft palate) to slide backwards, which can block your breathing. Prescription dental devices (also known as a dental appliance for sleep apnea), as noted in a University of Maryland Medical Center report, are designed by a dentist or orthodontist to prevent your tongue from shifting backwards and blocking your throat during sleep. Inspire is a new device that requires an outpatient procedure to implant a generator and a breathing sensor lead to activate the device. The device monitors your sleep breathing patterns and, when needed, sends a mild stimulation signal to key airway muscles to keep your airway paths open. Surgery is often the last resort for sleep apnea sufferers, and for good reason: sleep apnea surgery can have serious negative side effects, and surgery also has varying success rates. Nevertheless, if you have an anatomical problem that is causing your obstructive sleep apnea, surgery might be the best option for you. Nasal surgeries correct obstructions within your nose that target three main areas: the septum, the nasal valve, and the turbinates. Turbinates are a network of vessels, bones, and tissue that work to filter, warm, and hydrate the air that comes in through your nasal pathways. If they become swollen, you’ll be congested all of the time and you’ll have difficulty in getting sufficient levels of air. Uvulopalatopharyngoplasty (which thankfully has an acronym, UPPP) removes any excess tissue you might have within your pharynx and soft palate. The pharynx is located at the rear of your mouth where it intersects with the top of your throat. The soft palate is located in the back portion of your mouth’s roof area. You now have a treasure trove of information that will help you decide whether to use a CPAP or to try another avenue to manage your OSA! If you’re currently on a CPAP treatment regimen, don’t stop or reduce your routine until you’ve discussed other options with your sleep apnea doctor. To read the article related to this video please click this link: CPAP Alternatives We’ve Got You Covered! The information has proved very beneficial. I’m claustrophobic, hate things stuck in my nose, and love the freedom of movement while sleeping so the many alternatives along with natural treatments were things I needed to know . wat will or could happen if you quit using a cpap machie after once using one?